By July with Dinobot, we'll have had three in two years. Five if you count the alternate Primal and Shadow Panther. So if they keep around that pacing, it shouldn't take that long (relative to G1 of course). Plus the thing to remember with MP Beast Wars, there are no restrictions EG Licensing issues, no Triple Changer or Gestalt omissions either, for the most part. So they can release these quicker than the rest of the line. I forgot about the alternative Primal, does that mean a similar release for megs? Have they gotten round to tigatron yet? Seems like an easy one with minimal changes to the cheetor mold. I don't know if there will be an alternate Megatron. Essentially the original Base toy for Megatron wasn't anything to write home about. Depends on what comes with MP-43, it may not be necessary. I liked both Inferno toys. I too, own the Scavenger toy and don't hate it as others do. ZeroWolf wrote: This will come with a rubber ducky yes? If he doesn't come with Rubber Ducky, I will be ever so slightly saddened. The first MP to break $300, here we come! Also, the new pictures show a hand in his tail just peeking out. I am happy with that. That being said, there should be no reason that he is any more expensive than $200. For one thing, he's made of much larger (and fewer) parts than either dinobot, cheetor, and primal. So, short of electronics, he should be about that same price as primal in my books, if he pushes $300 just because he's big, I'm going to be very irritated. ZeroWolf wrote: I forgot about the alternative Primal, does that mean a similar release for megs? The thing about the alternate Primal was that it had the added benefit of having appeared in a theatrical feature-length movie, so that toy was able to be marketed as a movie version of the character, on top of the added toy-based bonuses it received. 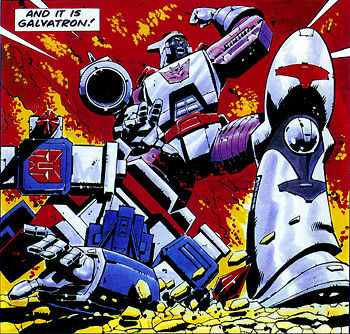 If anything, I'd prefer a retool of Megatron into T-Wrecks. That is probably what will happen since that character has appeared in media using elements of his mutant head which the beast wars redeco are all about adding. And plus it would be like the cheetor reeco, which was also about homaging a redeco of the original toy. While it is what I'd prefer, it's also what I'm not expecting since, unlike the toy/movie-based Primal and the Japanese-in-origin Shadow Panther, T-Wrecks has never really had a presence in Japan. In fact, all of his fictional appearances have sadly been confined to BotCon/Club fiction. 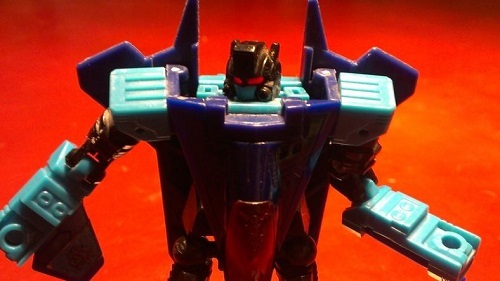 Never say never, it's just that the bw toy that I've owned for ages only ever had one half of the mutant mask and instead of taking it off, I kept it closed, adding it to my head cannon as a mask he wore because of facial damage he received. He never had it repaired so it could be a constant reminder of the threat he made to repay it back tenfold. Hellscream9999 wrote: That being said, there should be no reason that he is any more expensive than $200. For one thing, he's made of much larger (and fewer) parts than either dinobot, cheetor, and primal. 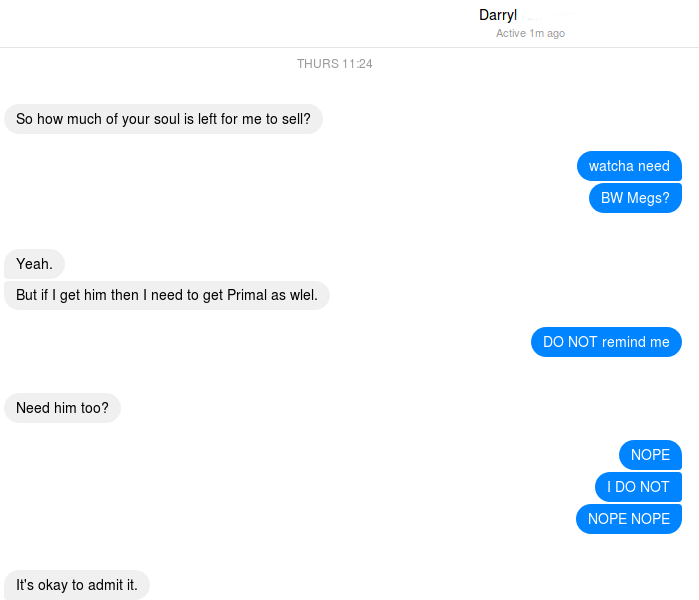 So, short of electronics, he should be about that same price as primal in my books, if he pushes $300 just because he's big, I'm going to be very irritated. That, and the only reason why Dinobot is so expensive in the first place is because of all the stuff he comes with. Megatron doesn't exactly jump much so there's really no need for a massive stand. At best he'll have light up eyes and some tiny accessories he's known for and that's really it. I feel like if they do a toy repaint he would actually cost more since he'd probably have his mutant helmet and maybe new hips with non-firing missiles. I'm thinking with this and the stuff you mentioned Megatron will be closer to 17,500JPY (maybe even as low as 15,000JPY) to Primal's 12,000JPY. A topical (and regular) conversation in the Burn (in white) - Va'al (in blue) online household. Va'al wrote: A topical (and regular) conversation in the Burn (in white) - Va'al (in blue) online household. It is okay to admit it. Gotta say, Va'al, Primal is a very very good toy to own. You could make a very small but quality collection of just owing the Beast Wars MPs. Agreed. It was the quality of Primal that convinced me to invest in the entire line (both sides). That said I had the original Base Primal too and he was quite decent, even back then. The one slight nitpick I have with the MP Primal is that he doesn't come with a Riot Shield, as the original did. 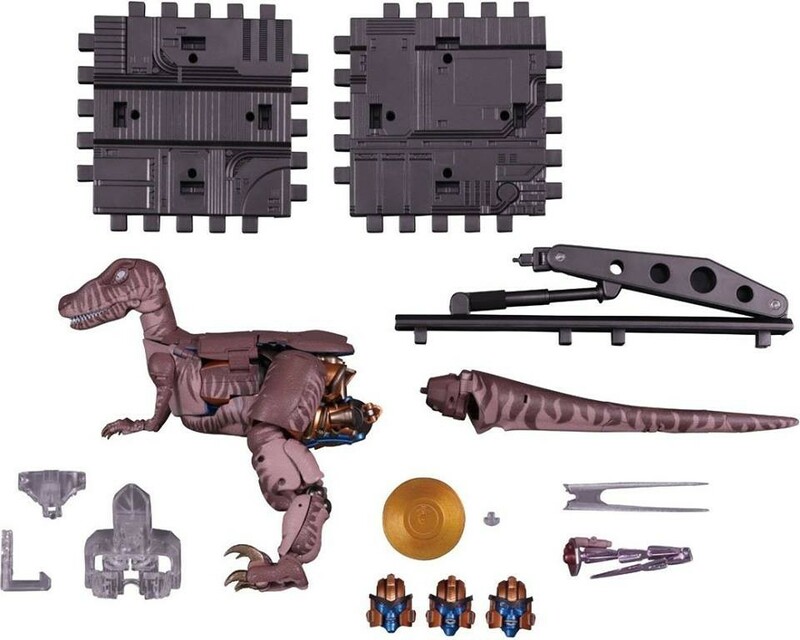 BTW, There seems a lot of extra bits with Dinobot. I can make out the Sword, eye lasers, faces, Golden Disk and the ridiculously oversized stand (that I will never use) but what are the grey pieces in the bottom left? Doubtful. The season 1 cast of the Canadian series seems to be the most popular in Japan. In particular, Japan gives no beans whatsoever about the Transmetals. If anything beyond the Season 1 cast has a chance of getting a MP, it would be Lio Convoy, and even his chances are already slim to none. AllNewSuperRobot wrote: The one slight nitpick I have with the MP Primal is that he doesn't come with a Riot Shield, as the original did. The 1996 Primal came with a riot shield? I hae the toy but I dont know what you are talking about. Sabrblade wrote: The season 1 cast of the Canadian series seems to be the most popular in Japan. WOOHOO! go Canada! Seriously though, how awesome is it, for me a Transformers fan, that both Prime and Primal are canadians. 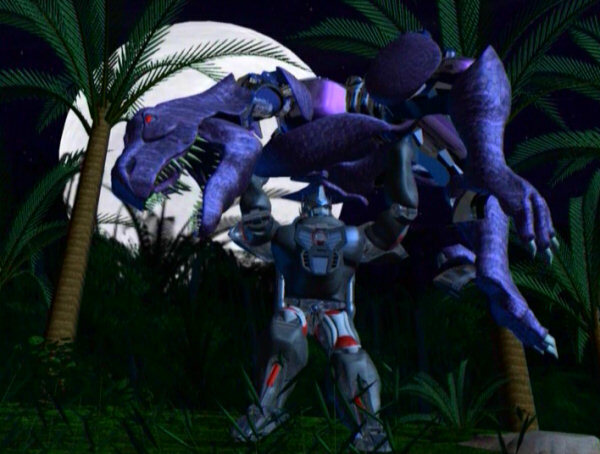 AllNewSuperRobot wrote: BTW, There seems a lot of extra bits with Dinobot. I can make out the Sword, eye lasers, faces, Golden Disk and the ridiculously oversized stand (that I will never use) but what are the grey pieces in the bottom left? Adapters for the display stand. One is to hook the Golden Disk to the base, one is to connect Dinobot to the base in robot mode, and one is to connect Dinobot to the base in beast mode. This problem, again? If the Japanese Market keeps holding all of these lines back, HasTak needs to ignore them and capitalise on the Global Fanbase instead. I pretty sure there are more of us, outside of Japan and we most likely hand over a lot more money. Leave them to their endless Car Bots and Optimus Primes, I want MP Rampage, Depthcharge and an MP BW Ravage that transforms into a Cassette! Aww That's a shame. I thought we were getting some additional show extras I couldn't place. 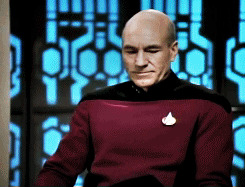 So who is getting the Vok Disk? Tigatron? Inferno? Tarantulas? In one episode of Season One, Primal uses a Riot Shield. K9 and Wolfang (who I also own) do come with Riot Shields, attached to their backs. Which with a bit a twiddling back in the day I had Primal hold. So in essence I was projecting my own minor retooling as a default for the figure itself. He's too small. Or the other Beast Wars MPs are too big. Sodan-1 wrote: He's too small. Or the other Beast Wars MPs are too big. The scale is about right so far. Ascending from Cheetor to Primal to Dinobot to Megatron. Inferno-Rhinox-Tigatron are the next three, descending from Dinobot. Everyone else is tiny. Too small? Megs is gigantic. He's taller than Dinobot, who towers over Primal. I hope not too much though, they are supposed to be able to fight one on one without it looking incredibly outmatched (as an homage to King Kong). As little often as we saw the two face to face in their robot modes during Season 1, Megs was rather bigger than Primal.